Storage is always at a premium in a small space like a bathroom, and while medicine cabinets and bathroom vanities can keep plenty of things in a safe place, many people are looking to incorporate their own unique design. According to Better Homes and Gardens, creating a cutaway storage shelf in your wall will create storage space out of nowhere and offer a new blank canvas to display some dazzling color. When you've installed the shelving area, consider painting the frame in a dark neutral color like black or brown and then using the inside areas for brighter hues. For instance, you can use fabric wallpaper on the back wall of your shelves and pair them with matching candles and soaps to create a uniform look. Your new storage space doesn't have to be limited to bathroom supplies. Use family photos and other decorative accents to put your personal stamp on the space and offer a bit of contrast. 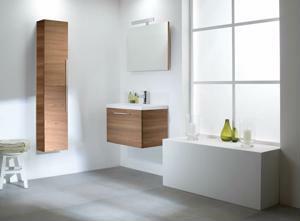 Adding storage can not only improve the utility of your bathroom, but provide a wonderful new spot to decorate. How would you choose to jazz up a cutaway storage area?